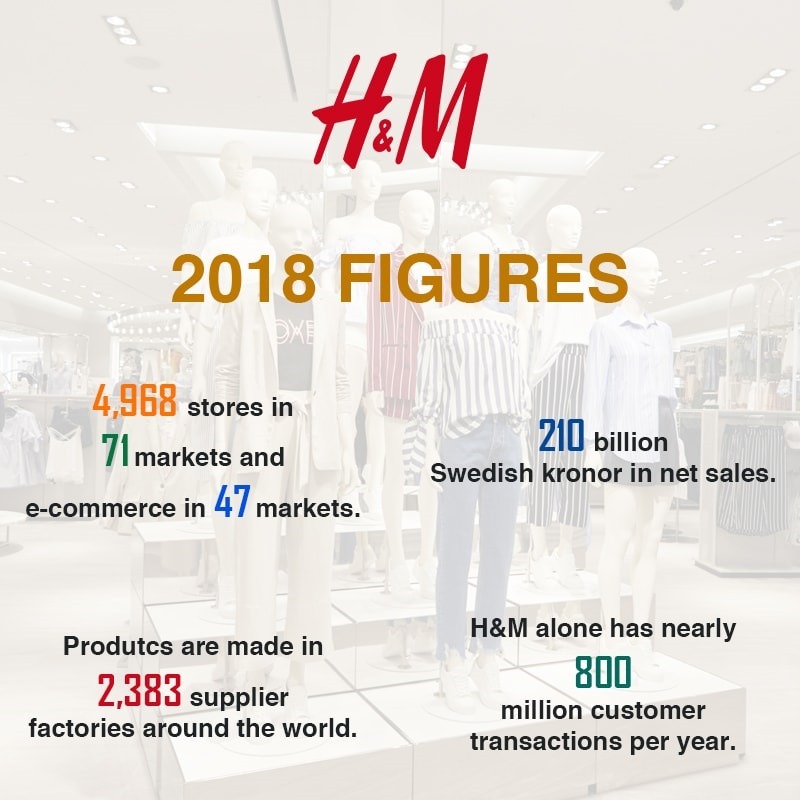 Hennes & Mauritz AB, a Swedish multinational and also one of the biggest clothing-retail company, has recently released its SUSTAINABILITY REPORT for 2018. In 109 pages of the report, the company has reported its efforts towards sustainability and also the future plans to enlarge the ambit of sustainability in its entire supply chain. Before we move towards the key highlights of this report, let’s look at some key figures of H&M below. Currently, the company operates in 71 markets with 4968 physical stores and have online shopping facility in 47 markets which collectively bring 22,696 million USD of net sales. The company is currently working with 2383 factories globally and has claimed to 800 million customers on an annual basis. “From the beginning, our role has been to democratize fashion. Today, that means making it sustainable: it’s the only way we’ll keep making great fashion and design available today, tomorrow and for generations to come. We will continue our work to lead the change towards a sustainable fashion industry”, says Anna Gedda, Head of Sustainability H&M Group. As per the released report, the company claimed to recycle 57% of all materials used during the course of production/manufacturing in 2018 which is 23% more than what they had last year. So far as the recycling of cotton is concerned, it reached 95% and the company is targeting for 100% for next year. The report further stated that, approx. 20,649 tonnes of textiles were collected for reuse and recycling through their collecting initiative which is 16% more than last year and represents the equivalent of 103 million T-shirts. The company also managed to reduce the carbon emission by 11% from the year 2017 and as per the report, the group set new goals of reducing absolute GHG-emissions in the company’s own operations by another 40% by 2030. 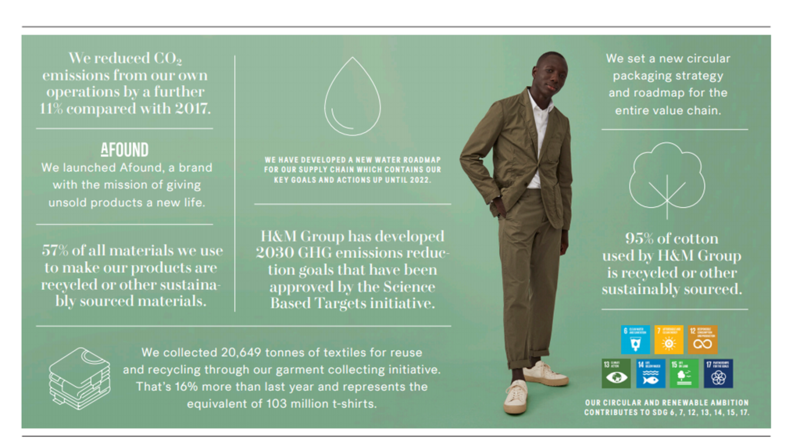 Not only production but H&M has also reportedly set a new goal of using either 100% recycled or sustainably sourced materials for all kind of packaging by 2030. The group has also created a roadmap to save the consumption as well as to re-use wastewater, which will be supported by WWF, and the target would be to reduce the water usage by 25% in production and to recycle 15% of wastewater back into production processes by 2022. 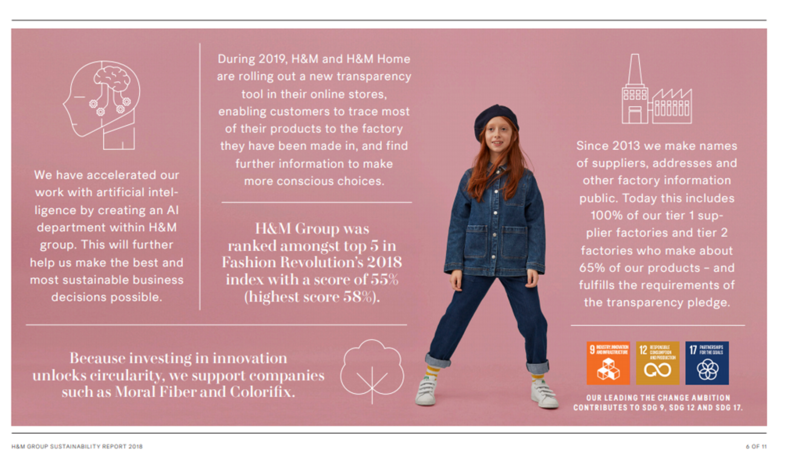 Taking the entire narrative of Transparency to a different level, according to the report , later in April, H&M and H&M Home will add more information to its products on hm.com, enabling customers to find out in which factory their favorites products were produced, as well as further information on material composition and solutions for re-using and recycling products that are worn-out. The group has also launched The Take Care Concept in further four markets, offering customers guidance, repair services, and products to care for their garments so they can live a longer life. The company has invested a lot of resources in the Artificial Intelligence to ensure the effectiveness in the entire supply chain and also to make it easier to ensure a good match between production and demand, thus saving energy, transport, and resources. Result: Exceeded the goal. 67% of their product volume is made in factories that are implementing improved Wage Management Systems. This covers 500 factories and about 635,000 workers. Result: Exceeded the goal. 73% of their production volume is made in factories that have democratically-elected worker representatives in place. This covers 594 factories and about 840,000 workers. Result: Reached this goal ahead of schedule. 100% of their tier 1 supplier factories in Bangladesh had democratically-elected worker representation by December 2017. Result: Reached this goal, 93% of their business partners see H&M Group as a fair business partner by 2018. With such encouraging results, now the company is also focusing on building industry collaborations. Therefore, a conglomerate of 22 brands, several Industries, a global trade union representing the textile workers, have been formed which will come together within the collaboration platform. The objective is to create a ground-breaking system change and to transform the textile industry by promoting collective bargaining agreements, that are supported by brands’ responsible purchasing practices. The brands within this arrangement have signed a Memorandum of Understanding which commits them to ensure that their purchasing practices facilitate the payment of a living wage. “The fact that 22 global brands have come together to tackle the issue of wages in the textile industry makes ACT a really ground-breaking coalition. It’s a true game-changer for the industry, paving the way for collective bargaining agreements and making it possible to find solutions at industry level which will stand the test of time. 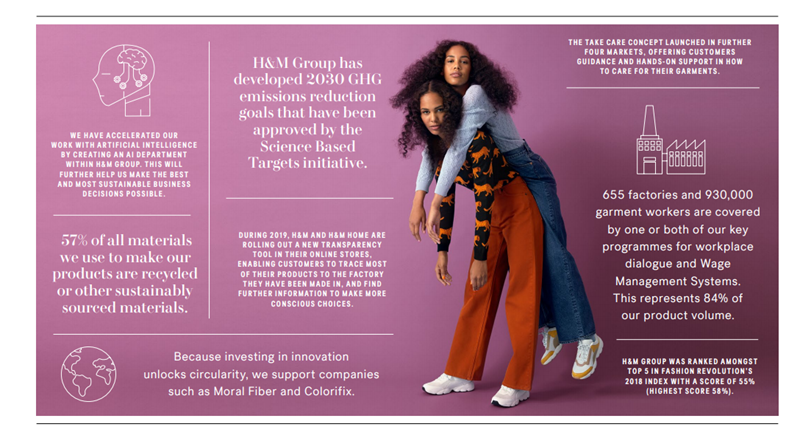 By ensuring that brands’ purchasing practices are included in the equation, a crucial step in creating a solid foundation for fair living wages has been taken”, says Jenny Fagerlin, Global Social Sustainability Manager H&M Group. Keeping the sustainability in the center, Denimsandjeans Vietnam is also coming up with its 4th edition of Denim Show under the theme- MY EARTH MY DENIM which is scheduled for June 12-13 at Ho Chi Minh City. 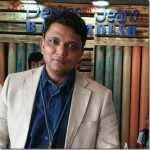 To get the invites, log on to www.vmshow..denimsandjeans.com.